Okay, so it was only 6000 beads, not counting the ones that dropped on the floor, zoomed into my toothpaste tube, and bounced their way into cracks too small to be seen with the naked eye. I also found two of them inside the Marriage Fern, eleven huddled in fright near the vacuum cleaner, and one adventurous little guy swimming around in my coffee cup. 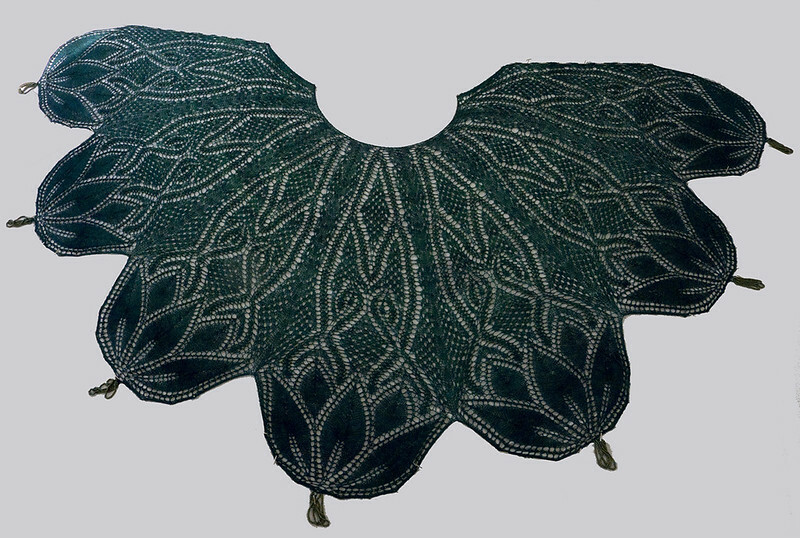 Disregarding the excessive beadiferousness this shawl entailed, the Nouveau Beaded Capelet is a fabulous knit. The pattern is flawless, original, clever, and just plain stunning when completed, as you can see. The shawl begins with a tassel on each of the seven scallops, which are knitted individually and then placed side by side on a long circular so the remainder of the shawl can be worked. Because the rows become shorter and shorter as you work towards the top, it never became boring; I had a difficult time putting it down to do other things. 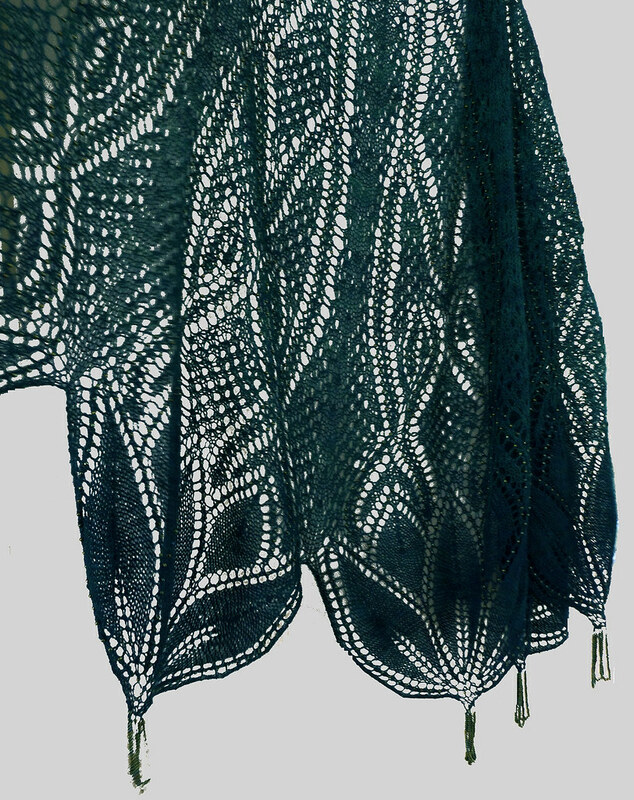 Almost every yarnover has a bead, which creates graceful lines of glitter up the shawl. The yarn, a green 50/50 merino/silk blend, will remain nameless. I found it in my stash and thought it would be perfect for this elegant project. I continued to think so, right up until I ran into the first of 14 knots in the 1250-yard skein. Worse, something--a cat perhaps--had clawed at parts of it, so there were lots of sections that were fuzzy or sported a broken ply. By this time, I had finished the scallops, so I just gritted my teeth and Russian-joined every thirty yards or so. There were several further unpleasant surprises waiting at the finale though. The yarn was dyed in such a way that it produced hideous striping in dark and light green. The poor thing wasn't off the needles for ten minutes before it found itself floating in a pre-soak so I could overdye it. And--wait for it--the dyer hadn't bothered to fix the color, so her greens bled copiously into the presoak water. No amount of rinsing would remove the excess dye, which had the temerity to turn my fingernails green when I flipped the shawl over. 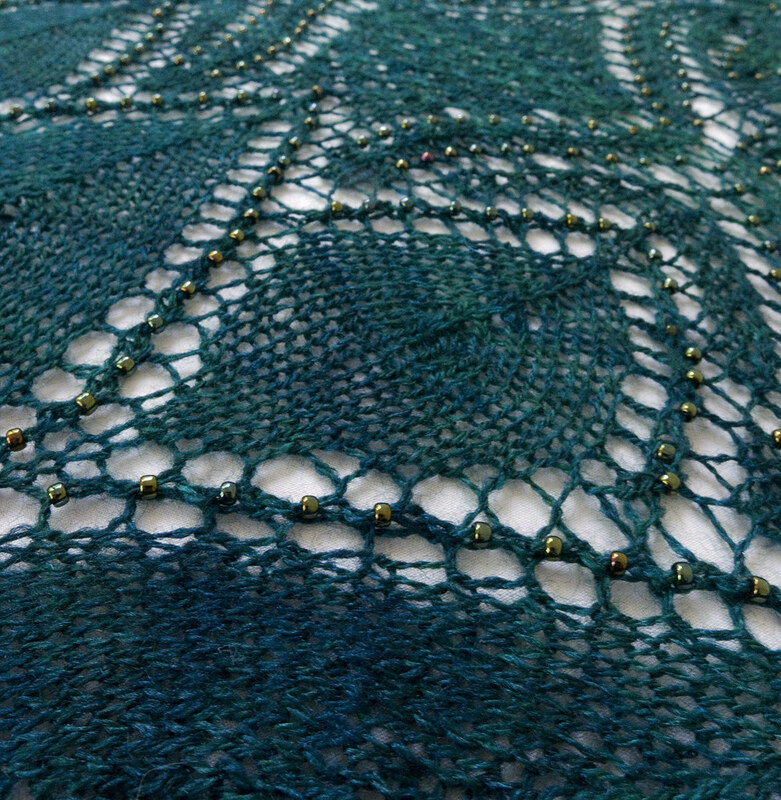 Gritting more teeth, I arranged the shawl in such a way that the scallops would soak in a dark turquoise dyebath for several hours, so the bottom of the shawl would be darker than the top. Then I flopped the upper section into the dyebath and cranked up the heat. 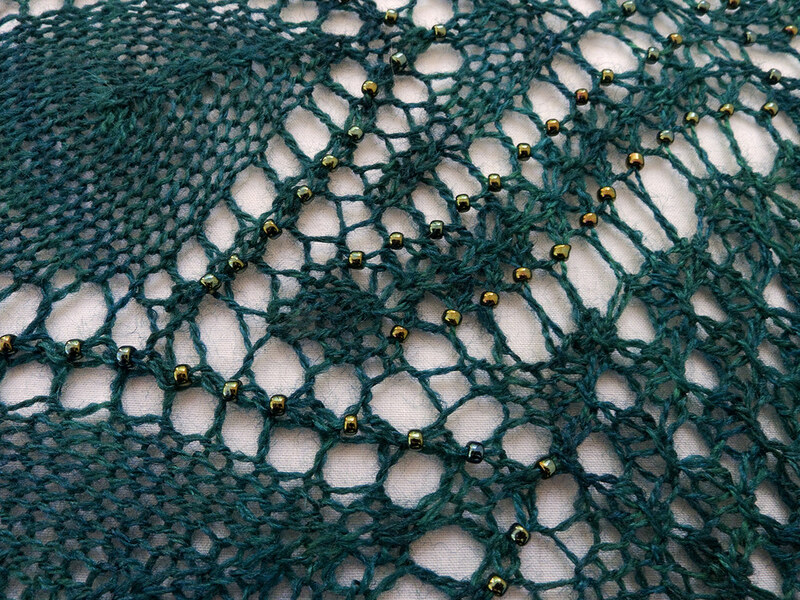 Aside from the fact that the color is now a pretty peacock green and the pattern itself is graceful, it feels incredible when worn--the weight of the beads makes it drape beautifully and it seems to be more a piece of jewelry than a garment. I'm sure I'll be picking up beads for months, but the result is worth it. "Stunning" would be an understatement. That is beyond stunning. I am lost for words. It is fantastic. Fantastic work! This pattern was already in my favorites, but I don't think I'd seen anyone mention before that the weight of the beads gives it heft and drape when you wear it. Pretty! and a lot of work. 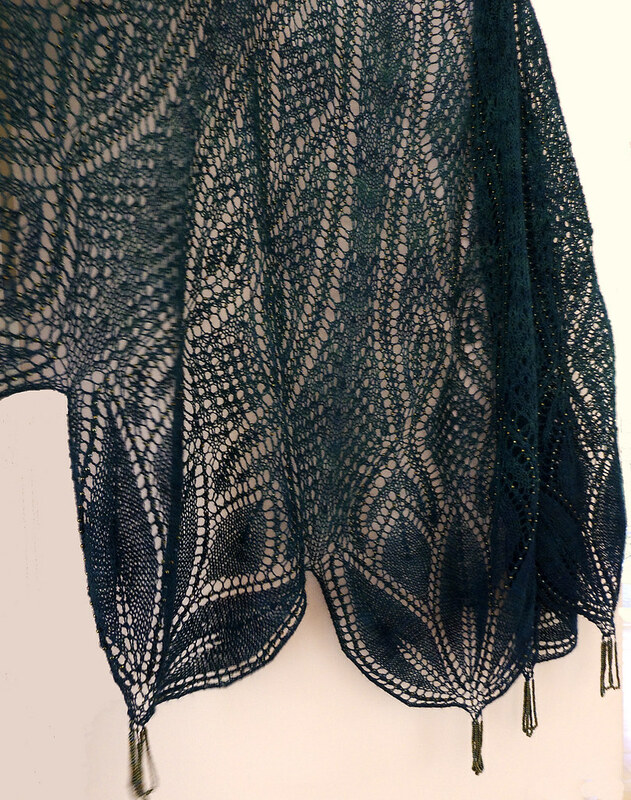 I have to confess I have yet to make the first beaded shawl, it does not appeal to me. I do admire those that do! Beautiful, absolutely beautiful! I'm also sure you forgot to mention the beads that show up in unmentionables, places no self-respecting bead should go. I've never figured out how they migrate there - unless it's fear of the vacuum. Really gorgeous. Your overdye with the darker color and the bottom adds an extra dimension to the effect. Very, very beautiful. I hope all the teeth-gritting did not cause a visit to the dentist. Coincidentally, a bead-loving friend pointed that pattern out to me yesterday. Yours is spectacular! Gorgious shawl. Yet another thing to add to my growing list of projects to do! I *love* the effect you got with your overdye job. Beautiful. Sorry to hear the yarn was a pain & I'm hoping that you aren't reminded of it every time you touch your gorgeous work. *THUD* don't mind me, I'll just pick up my jaw...Holy Russian join, what a gorgeous cape. I have to ask, what do you do with your shawls, when you're not wearing them? This pretty thing shouldn't ever see the inside of a dresser drawer. 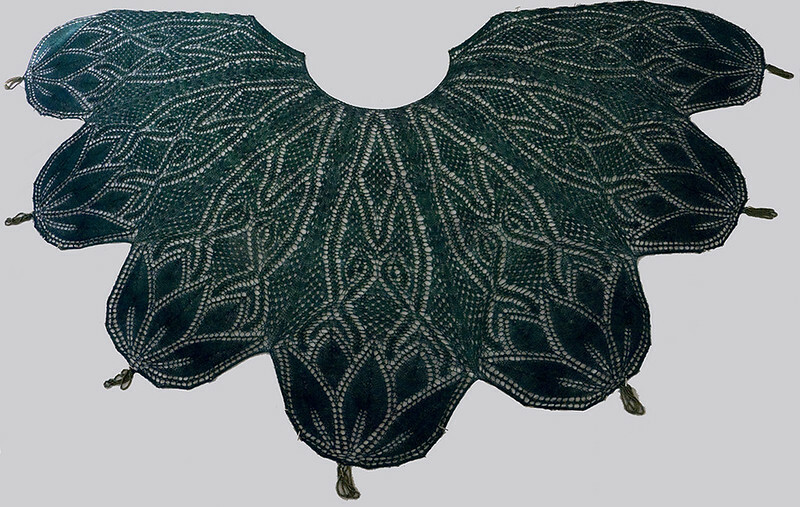 I never wanted a beaded shawl until now. This is one of my favourite lace patterns - I so want to make it, but have nowhere to wear it - but now I've seen yours I think I might make it anyway! Your dye job looks perfect -- as awful as your experience with the yarn was it all paid off. I bet it's not only lovelier in person but that anyone who feels the weight of beads in it finds it all the more seductive. Hellooooo. You disappeared from my Google reader and I hadn't realised ... I thought you'd abandoned the world of blog and all the while you were doing Fleegally things, like knitting the most amazing beaded confection. The shawl is stunning and I am just happy to discover you are still here :D Right, now for a good catch up on all things Fleegle ... did I spy a book further down the page?! I never ever comment on blog posts but this is so stunning and inspirational. I can't wait to try my own! I told my daughter, the bead nut, about the 6000 beads and the odd places some of them wound up--she just cracked up. I'm taking her to the library tomorrow, & dreading her actually seeing this capelet. I will have to figure out what to negotiate for in payment for her own beaded beauty. I have a nice lace yarn, in a lighter teal, also some black mohair that she bought for me. 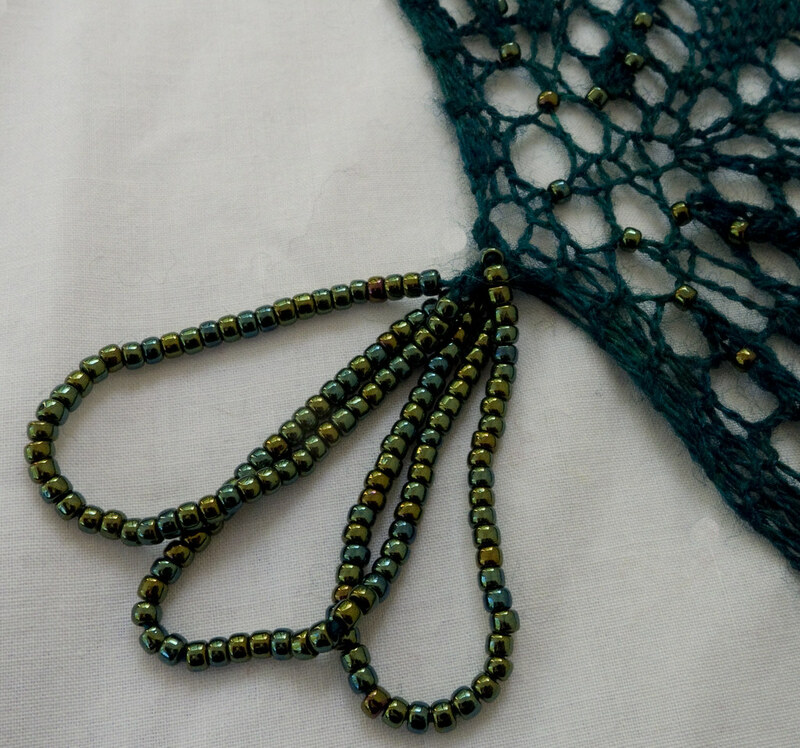 Lace, mohair, & beads? Sounds like a trip to the Funny Farm for sure! 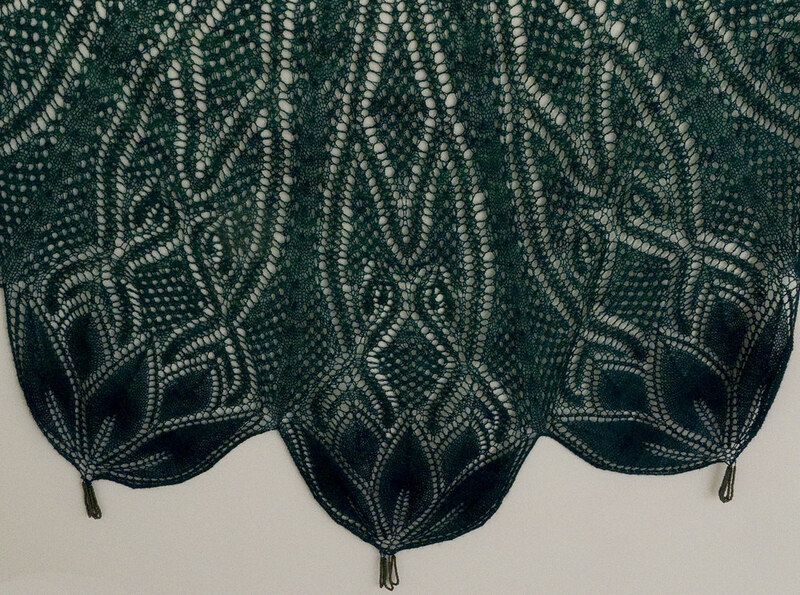 This is a lovely shawl. I think the struggles you endured make it that much more remarkable. Amazing. It is so pretty. Actually it is beyond pretty but I think all the good words have been taken! As always you did a remarkable job! and a great recovery on the dye job - kudos!! I'd hang this on a wall as a work of art. First you sold me on glitz, now I'm sold on beads. And I'm no longer working in just white/natural yarn. You have a lot to answer for. Thank you!!! Shame about your yarn, but you've overcome all the obstacles that seller put in your way. What a fabulous knit and what an incredible excercise in patience. I love your persistence in getting it right and deciding to dye it. Greetings, Fleegle! I was linked to your blog from Spin Artiste, where I read your lovely interview. I had purchased some LP3 from your etsy store based on a link from ravelry, without knowing anything about you (except that the color name "Klingon Blood Wine" is awesome). I decided subsequently to use your yarn for a mystery KAL on my blog that starts in two weeks. So you can imagine my surprise and delight when I read your interview and realized there is so much more to you than your etsy store! I resonate with your love of publishing and your humor in writing, and it goes without saying that your spinning is sparkling. I think, however, that we must completely disagree on the subject of brown. 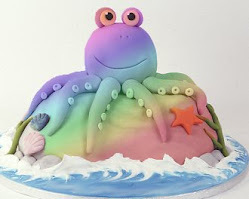 Just found your blog yesterday and I have to say that I love it. I spent all last night and this morning reading it while spinning and have been quite entertained. I now blame you for the $60 of purchases I made this morning and that I have to explain it to the dark haired man that lives with me. I couldn't help myself, I really needed Fleegle Spins Supported and since I bought the book, I really really needed a support spindle to go with it. I wish the book was available in a download format because I can't wait to get it. Just absolutely stunning! A lot of pre-work but ..... A work of art now!